On a recent rainy day I took my D200 out to see if I could get any good photos and even though I had nothing in mind per se, I knew I wanted to take advantage of the overcast light as well as the drizzle gently falling to the ground. After walking around for a few minutes I spotted this chain attached to a couple stantions and thought it might make for an interesting photograph. 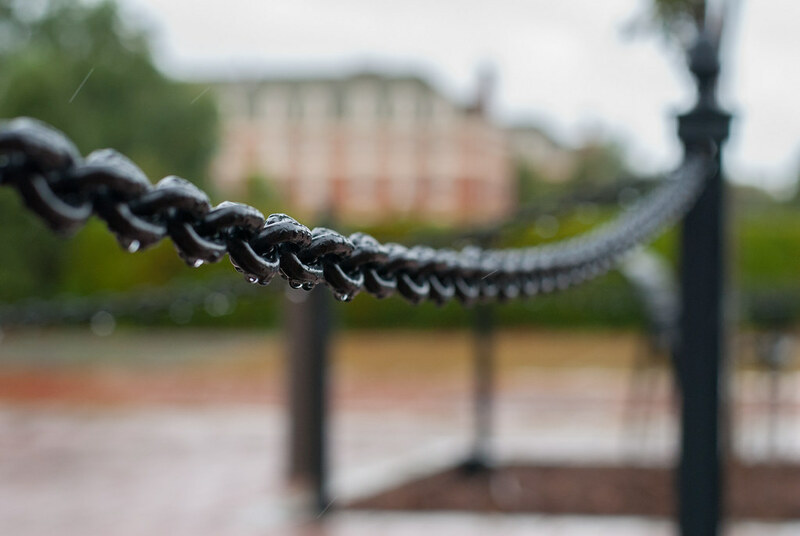 I wanted to get a picture of the water drops hanging off the chain links, but there were other elements to consider too: what angle to shoot, where I should position myself, what else to have in the frame, what exposure settings to use, how little depth of field I wanted, etc. Having taken similar pictures in the past I knew that I wanted to focus the viewer’s attention on just a couple drops, which meant I had to find a way to get a shallow depth of field without going overboard. It’s tempting to open up the aperture on your lens for shots like this because to get ultra-narrow depth of field, but sometimes that can backfire by eliminating the other elements of the picture that give your subject a bit of context.